Not enough people around the National Hockey League are talking about Mikkel Boedker. I have even overlooked his scoring ability because the Dane has been sitting on my fantasy hockey bench the past week. Boedker is tied for second in the NHL in goals with the Philadelphia Flyers’ Wayne Simmonds at 5 a piece. Much has been made about Simmonds’ scorching hot start to the season and rightfully so. Yet Boedker has posted similar numbers, 6 points in 3 games against Simmonds’ 7 points in 4 games, is two years younger and is following along a similar scoring growth as Simmonds. Simmonds is the better offensive talent but some of the attention given to his rise to superstardom should be shifted to Boedker. The Arizona Coyotes having a budding superstar too, you know. Mikkel Boedker’s speed is one of his biggest weapons when creating offense, but it is his thirst for the net and his patience that are his most effective tools. Many NHL players lack the courage to head straight for the congested areas in front of an opponent’s net, but Boedker thrives in that real estate. The best example of his nose for goal comes at the 0:38 mark of the video. While on the power play, Boedker picks up a pass on the half wall and carries the puck into the slot for a better shooting opportunity, with which he makes no mistake. He also doesn’t just take an early shot in the slot; he carries it right down Broadway into the heart of the Los Angeles Kings’ vaunted defense for a better opportunity. Plenty of Boedker’s goals from last year came from in close or off of an opportunity where he carried the puck into a good scoring opportunity. Boedker doesn’t waste a lot of time because once he gets the puck he’s heading straight for the net. That doesn’t mean, however, that he holds onto the puck for too long. At the 0:25 mark Boedker corrals the loose puck in front and instead of shooting at a square Jacob Markstrom, he moves the puck laterally to change to the angle. This movement may have thrown the goaltender off just enough to allow the shot to squeak through. Boedker probably would not have scored had he’d fired the shot as soon as he first corralled the puck. Boedker’s combination of speed, ability to find open areas and his patience allows him to find the most dangerous areas in the attacking zone. 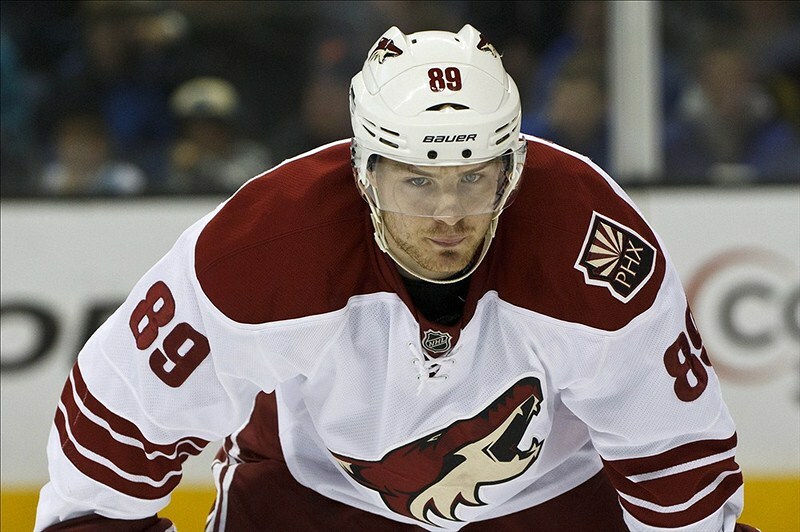 With the losses of Radim Vrbata and Mike Ribeiro, Arizona needs a top line winger to pick up the scoring slack. 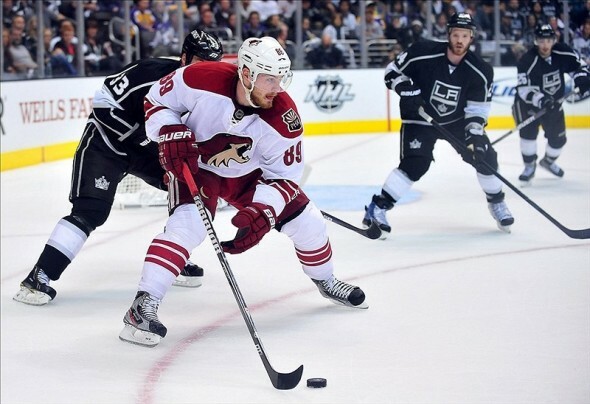 Mikkel Boedker is ready to fill that need. Boedker is coming off of a very solid season a year ago, posting 19 goals and 51 points in 82 games. The Dane is only 24 years old and has seen his points per game rise in each of the last 3 seasons from 0.29 to 0.54 and finally 0.62 a year ago. Boedker is also very durable since he has played in every available NHL game in three full seasons. He won’t lose production to an injury. All this points to Boedker breaking out into a star and his torrid pace to begin the season is meeting these expectations. He’s been a serviceable scorer early in his career, but now he has the opportunity as the top dog in Arizona to put his offensive weapons on full display. Even though his hat trick last night only happened because of an empty netter, Mikkel Boedker has been productive enough to show the rest of the NHL that he’s ready to break out. If only the rest of the hockey world would pay attention.